Today, more companies are ditching typical volunteer opportunities in favor of experimental, integrated approaches to social responsibility. At first glance, “doing good” might seem impossible for today’s tech startup. When you’re staying up into the wee hours of the morning to ship features and investors are your main source of revenue, thinking about your social impact strategy might seem impractical. But visionary founders know that doing good is the right thing to do. The business of it makes sense: we know talented people want to work and stay at companies that include some way to make a difference. * And customers care too. 50 percent of global consumers are willing to pay more to socially responsible companies. ** But what’s the time and cash-crunched startup to do? Don a company shirt to pick up garbage in a nearby park and then pose for pictures that went up on a website? I’ve done something like that. It felt contrived. Today’s standard approaches to making a difference as employees, typically called Corporate Social Responsibility (CSR) models, have been criticized for being self-serving, with a focus on team building and positive press rather than on delivering lasting value to any causes. How uninspiring! Thankfully, we’re seeing more and more companies ditch the t-shirt clad garbage picking in favor of experimental, integrated approaches to social impact. Instead of saving do-good projects for the future when they “hit 50 employees” “get that Series B”, [fill in the blank with company milestone], more and more organizations are building it into the DNA of their business early on. In other words, making a difference in the world and creating an organization where people want to work is no longer something to aspire to, but something to build from. You might be two people, or you might be two thousand, but regardless, getting started developing your social impact strategy is easier than you think. In starting our own social impact projects and paying attention to many others out there, I can point to four guidelines startups can follow to set a social impact strategy and maximize success from the earliest stages of its inception. Most generally, we’ve learned that programs that stick closest to what the company is best at are both easiest to execute and also the most impactful. For example, Twitter organizes communities through communication, and Box focuses on empowering nonprofits to do more by collaborating via the cloud. Airbnb launched a portal for people affected by a natrual disaster to find places to stay. On the old CSR model, a team of 20 engineers volunteering for a full 8 hour work day could pick up a lot of trash in the park with those 160 hours of labor. But what could 160 hours of engineering time time accomplish if asked to harness the power of their unique skills? 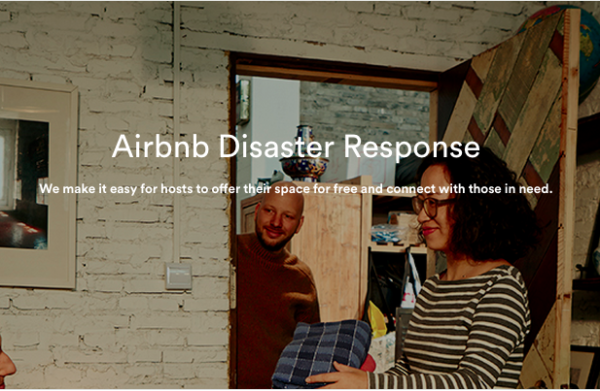 Airbnb developed Disaster Response, a portal allowing 1,400 hosts to open their doors to people who had been flooded out of their homes by Superstorm Sandy. The portal is still being utilized today during other natural disasters. Zendesk designed Link-SF, a site for people in need of food and shelter in San Francisco, which could help thousands of people for years to come. Optimizely employees volunteer conversion optimization consulting hours to run experiments for nonprofits. In just a few hours of work, were able to raise an additional million dollars for the Clinton Bush Haiti Fund. Not only does sticking closest to one’s expertise with skills-based volunteering deliver more impact per hour, it’s also more satisfying for those involved. There’s something special about contributing the unique parts of oneself towards a greater good. 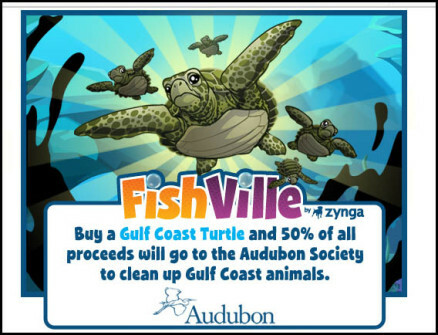 Zynga’s game FishVille allowed players to donate to the Audubon Society. Product discounts or donations can empower nonprofits and foundations to do their great work even better, and in turn drive more results than had you just donated the equivalent dollar amount of your product donation. Let’s look at the amplification when companies stick close to their wheelhouses. Salesforce has thousands of nonprofit and higher-ed customers on their steeply discounted plans, including the American Red Cross, whose critical fundraising efforts were vastly improved after adopting the CRM. Zynga allows users to elect to play games for good, with the revenues generated donated to the cause of the game. A small Google Adwords grant resulted in GreaterGood.org to raise $90k more in donations, a 1,000% increase from the year before. Optimizely also offers a nonprofit discount, through which 12 million more students were introduced to computer science, just one story from our hundreds of partners. Foregoing a small amount of revenue by donating or discounting your product can multiply your impact, from day one of your business. Your nonprofit partner can patiently provide critical feedback in your product’s early stages. Our work on the Clinton Bush Haiti fund was undertaken when Optimizely was only a few people large and still in YCombinator. Even with great donated products and skillful volunteers, change-makers still need cash to run. Committing relatively cheap equity in the early stages of a company is far easier than trying to move stocks or cash after an IPO or other major company milestones. Salesforce committed 1% of equity the first day they convened. The Salesforce Foundation 1/1/1 (1% of equity, 1% of product, 1% of time) model has resulted in more than $68M in grants to the community, 23,000 nonprofit and higher ed customers and 680,000 volunteer hours. We too have committed 1% of our company’s equity and are donating it to our own 501(c)3 foundation, committing us to using those resources for our community. Some say for early-stage startups this is akin to donating “1% of nothing” — and there are great organizations to help you with the process. So why not? Luckily, you don’t have to go at this alone. There are organizations dedicated to helping businesses of all sizes scale their impact and funnel talented employee time to the right causes, including our own partner, Full Circle Fund. Optimizely is premiering in the first cohort of their Founder’s Pledge. Our hope is that in doing so, our example will encourage other startups to follow suit and integrate social impact into their business models. These initiatives go beyond community lip service and put our talents and our resources to work. Personally, I believe these sorts of programs are a step in the right direction towards creating a healthier, more equitable world. But you don’t have to agree on any moral grounds — having a clear social impact strategy is actually a competitive business advantage. Legendary Harvard Professor Michael Porter argues that serving the world serves your people and serves your brand, creating what he calls “shared value.” YC founder Paul Graham is even on board, arguing being good is just good business.